Do your children enjoy making crafts, drawing and simply being creative? Most families interduce their little ones to arts and crafts pretty early and their interests for creativity simply grows with age. GreenKidsCrafts is a favorite subscription service of many parents, and here's why... Their monthly boxes include fun and educational activities that are created to inspire, entertain and help to teach earth-friendly habits to our kids!! They're amazing and kids LOVE them! For a Limited Time Only you can receive a FREE Trial Kit!!! What's better then letting the kids test out the fun before actually committing to a subscription! Very RARE! 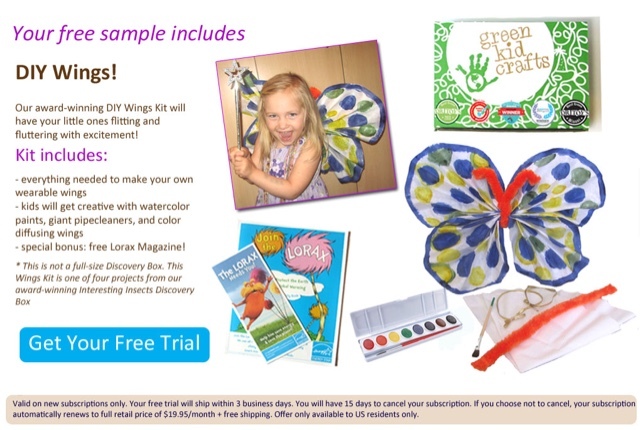 Surprise your kids with their very own GreenKidsCrafts Trial Kit today! Educational Fun, promised in each box!! !